Swannee River Railroad Company, LLC - THE F UNIT This all-new locomotive is now standard practice at the Swannee River Railroad Co! The new F Unit has many details including the low profile passenger pilot and buffer that doubles as a coupler pocket. Pilot also features rivet details and chrome trim. Other features include layered cab side windows and port holes for a 3-D look, lighted number boards, grab irons, stainless steel and aluminum trim is also included. The body is cut from rigid 12G Steel. This thick steel body gives the locomotive a solid appearance not to mention the added weight for plenty of traction. 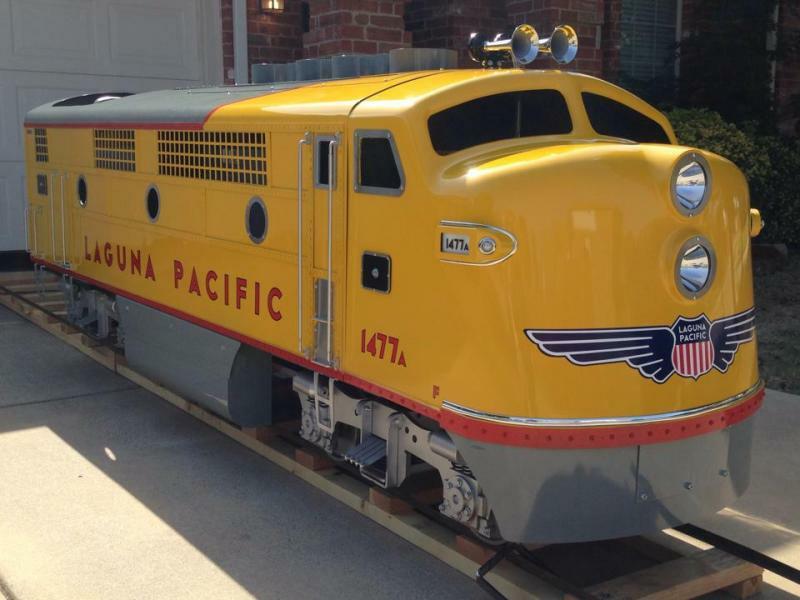 This is one great looking locomotive! Photos do not do justice to all the small details! The all-new Swannee River F Unit is now powered by a 1028cc Kohler 3 cylinder overhead cam liquid cooled diesel engine. This proven, high performance diesel engine utilizes indirect injection that delivers smooth power and reduced combustion noise. The automotive overhead camshaft design also reduces mechanical drivetrain noise.﻿ This sturdy engine is coupled to a commercial grade piston pump with oil cooler and Char-Lynn motors. Heavy Duty Trucks with 1.5" thick side frames are standard as well. This is by far the most cost efficient grand scale locomotive available market. 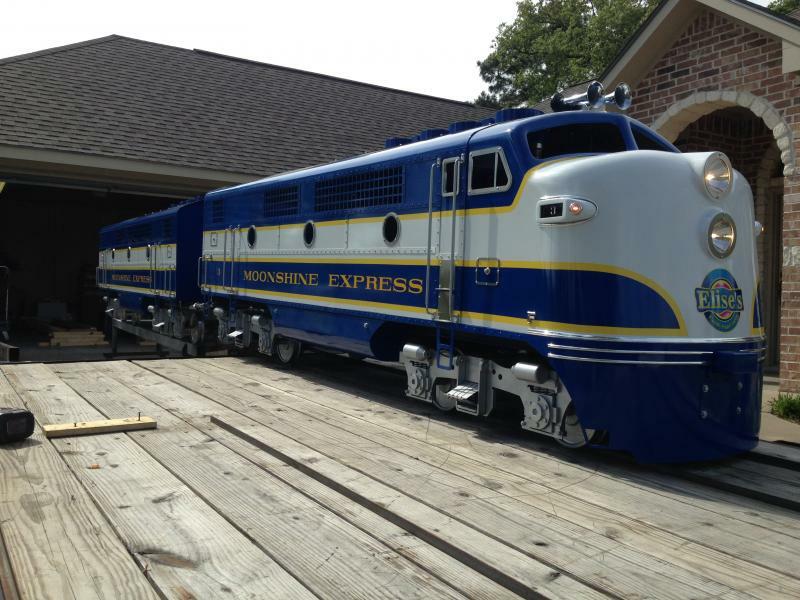 Locomotives are built with brand new parts and painted to customer specifications up to 3 colors (specialty paint colors or brands can be discussed for an additional cost).﻿ Seen above is The MOONSHINE EXPRESS F3-A UNIT #3. 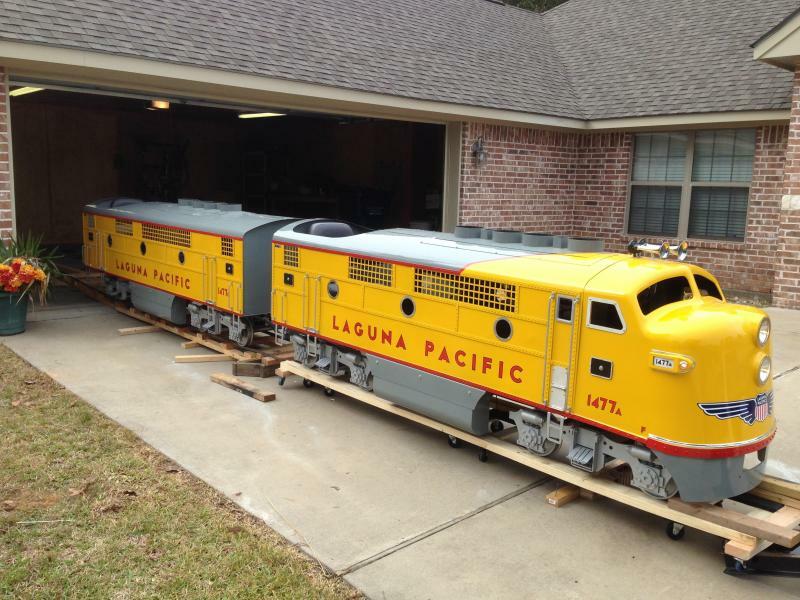 This awesome train set also features a powered B Unit and four passenger coaches. The LP 1477A is a 36volt Electric Unit - Available for private use or INSIDE Venues only LP 1477A and B - Both units are driven using 36V electronic controllers. Either can be opertated as a single unit or plug the A into the B and drive both from the B unit! Truly an awesome combination of power. 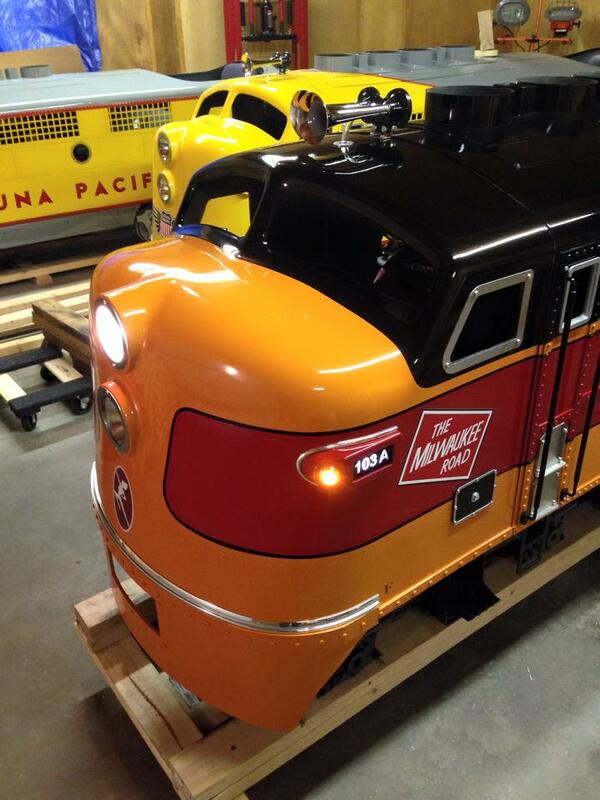 The Milwaukee Road, ready for delivery. This one sports our commerical Gas/Hydrostatic Drive System. Very Nice Detailing is STANDARD on all of our locomotives. F Unit Specifications Length-120"Width-32” with detailsWeight – Approximately appx 2000 lbsHeight- 37”Gauge- 15” or specify Diesel / Hydrostatic - Commerical Operation3 cylinder Liquid Cooled Kohler Diesel, commercial piston pump, Char Lynn hydraulic motors, and 4140 steel wheels are optional. 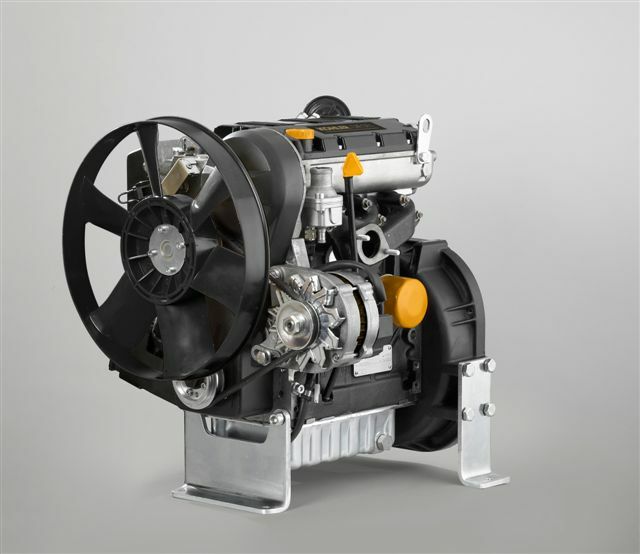 The Swannee River F3 Diesel is now powered by a 1028cc Kohler 3 cylinder overhead cam liquid cooled engine. This proven, high performance diesel engine is the same one POLARIS uses this same engine in the RANGER CREW DIESEL ATV. Other standard Features- Here at Swannee River, we want your train to be ready to go once it is delivered. That means put it on the track and go! Our units come RTG-That is ready to go. Your unit will come with many standard features such as dual front headlights, air horn for safety, paint and lettering. when it arrives. All other details such as ladders, grab irons, and lighted number boards are standard. Seen above is The MOONSHINE EXPRESS F3-A UNIT #3. This awesome train set also features a powered B Unit and four passenger coaches. LP 1477A and B - Both units are driven using 36V electronic controllers. Either can be opertated as a single unit or plug the A into the B and drive both from the B unit! Truly an awesome combination of power. 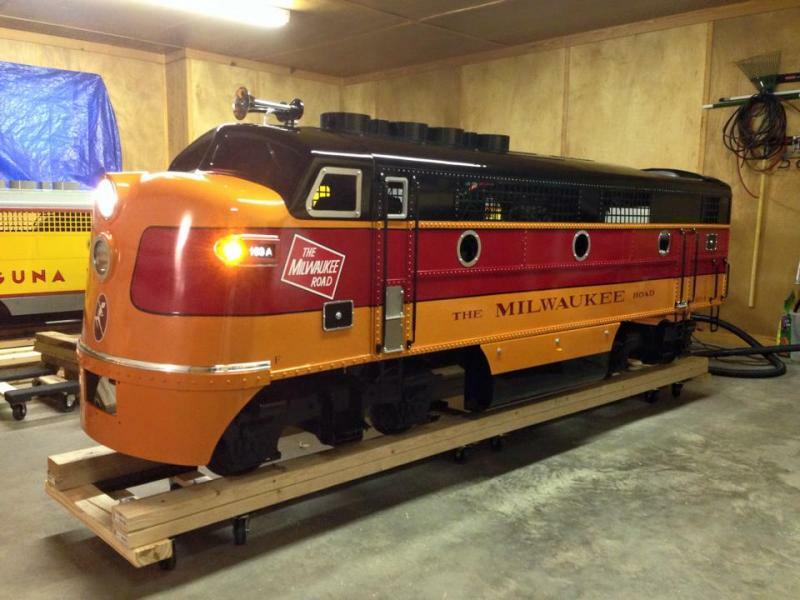 The Milwaukee Road, ready for delivery. This one sports our commerical Gas/Hydrostatic Drive System. Very Nice Detailing is STANDARD on all of our locomotives. 3 cylinder Liquid Cooled Kohler Diesel, commercial piston pump, Char Lynn hydraulic motors, and 4140 steel wheels are optional. The Swannee River F3 Diesel is now powered by a 1028cc Kohler 3 cylinder overhead cam liquid cooled engine. This proven, high performance diesel engine is the same one POLARIS uses this same engine in the RANGER CREW DIESEL ATV. Other standard Features- Here at Swannee River, we want your train to be ready to go once it is delivered. That means put it on the track and go! Our units come RTG-That is ready to go. Your unit will come with many standard features such as dual front headlights, air horn for safety, paint and lettering. when it arrives. All other details such as ladders, grab irons, and lighted number boards are standard.